A full litter brother to Ch Tjuringa Masterpiece (Morris) and half brother of Ch Tjuringa Firecracker (Bang) and Ch Tjuringa Romper Stomper and Ch Tjuringa Rising High (Sonny), Ollie is a multiple group winner and at his 6th show Runner Up Best in Show. Like Bang and Sonny, Ollie too is a Specialty Best IN Show winner. 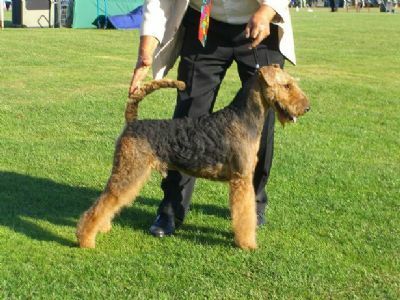 A stunning show dog of the right make and shape for a male Airedale who moves like a dream and commands attention in all company. 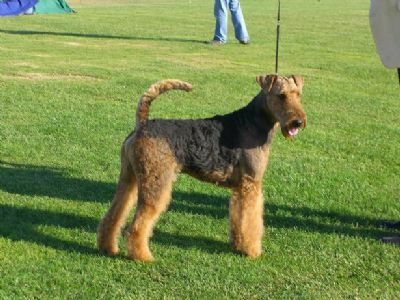 Ollie is number four terrier in Victoria and number two Airedale (10/3/08)Ollie has a good hip score and is at stud. 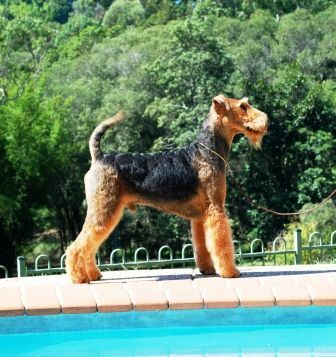 Currently (May 08) Ollie is being campaigned by Penny Smith and Shane Avery in Queensland where at the Airedale Specialty Show under breeder judge Ann Sorraghan, Ollie won Best IN Show.